A new neon ninja course and dodgeball court were recently debuted at Rockin' Jump Trampoline Park in Vacaville, California, US. The location opened in 2016 with a an open jump trampoline court, a slam dunk trampoline zone, air bag, battle beam and climbing wall. 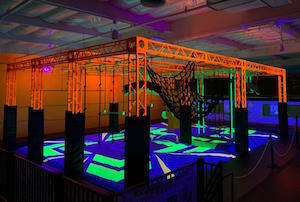 Following the recent retrofit, it now also features a glow-in-the-dark ninja course and dodgeball court, supplied by Best American Trampoline Parks. Best American's Neon Collection currently includes neon ninja courses that feature a steel truss system powder, as well as a choice of neon ninja elements that illuminate under black lights. Also included are a selection of customisable neon climbing walls, air bags and materials that can be incorporated onto trampoline courts. Todd Carlson, co-owner of Rockin’ Jump Vacaville, said: "There is a lot of excitement surrounding the addition of our ninja course. Guests of all ages are really looking forward to challenging themselves on the new ninja course. The feedback and responses we’ve received about the new attraction have been great for our marketing and social media. The fact that it glows in the dark adds a whole other level of excitement and intrigue."